Tom and Kip review the September Releases for Infinity: The Game, let you know what’s on the way in October and November from Corvus Belli, and talk about the news coming out of the Wayland Games Infinity Open Weekend. Observations after playing through Operation: Icestorm, contest winners named, and a new contest announced. Kip talks about Deployment, and we answer listener emails. Looking to start playing Infinity? Perhaps you already play, but need to get your army ready in time for that big tournament coming up. Maybe you just want to start a new faction. My new “Complete Infinity Army” painting service is here to help. You will receive a fully-painted, 300-point, tournament-ready Infinity army on your doorstep ready to rock and roll within one month from the time your order is placed for the all-inclusive price of $1000 (US). Email me HERE to get the ball rolling. Please put “Complete Infinity Army” in the Subject. That’s right. I will purchase the models, professionally clean and assemble them (including pinning where appropriate), prime them, paint them to the highest standards, seal them, carefully package them and ship them to your door via USPS Priority Mail. All included in the price. I’ll even help you build your list, if you would like me to. The whole shebang, one price ($1000). Yes, sir. If you know what you want already, great – but if you’d like list-building advice, I can help with that as well. I also have a lot of friends that are some of the best Infinity players across North America, so we can get advice when we need it on any faction and any mission. The price reflects the included plastic bases textured with sand and painted. If you would like custom basing such as the Tunguskan Bases from Warsenal, Micro Art Studio Bases, or Dragon Forge Design (and so on), those you can either purchase and send my way, or I can obtain them and add the cost (and shipping) to your order price. Any other basing requests can be worked out ahead of time. Ordering bases may add time to the delivery date. Anything you want. Studio scheme, something of your own devising, something based on reference photos – We can accommodate all tastes. The majority of models must adhere to a single, cohesive color scheme to be eligible for this offer, as the assembly-line nature of the painting is what keeps time, and therefore cost, down. What if I just want “Game” Quality? Then there are lots of other services that you could use. I put out top-notch gaming amies. I do not lower my quality of output, and paint “on the cheap.” This offer is for high-quality, beautiful miniatures that you will be proud to own and play with. Horde (Swarm, Spam) Armies too? The inclusive cost covers a maximum of 14 models (and a maximum of 300 points). Lists larger than 14 models will incur extra costs, on an individual, model-by-model basis. As a general guideline, extra basic infantry would be +$80. The price does not include any conversion or alterations of models. If it is absolutely necessary, details can be worked out ahead of time. Yessir. Unless this becomes insanely popular and the schedule fills up beyond expectations, you will have your models within 30 days of placing the order. 30 Days within the US. International orders may take longer due to increased shipping times. Out-Of-Stock Models. I will use a variety of sources to obtain the necessary models, but anything that is out of stock may increase the final time. Pre-Orders. Anything that includes models that have not been released yet cannot be completed before the models are available! 30 days will be from the models’ release date. Weather, Acts of God, Holidays, and other unforeseen events may alter the final delivery date unexpectedly. I will maintain constant email communication to keep the clients informed of any delays. What if I want to add on more models later? If it is another full 300-point army, then it will be handled as a new $1000 project. If it is just a few models to fill out the force and give you more options, we can discuss each commission on a case-by-case basis. The assembly-line nature of the offer keeps costs down; Individual figures added at a later date will be at a higher rate (approx $125/infantry). The more matching figures at a time, the cheaper they become. 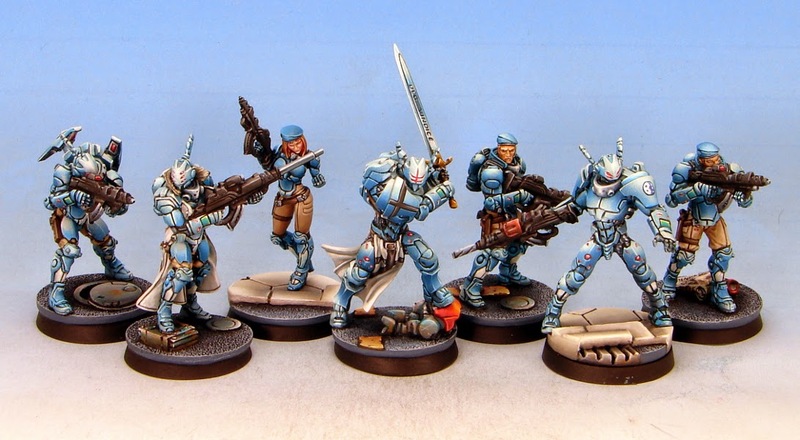 Where can I see more of your painted Infinity models? Just click on the word “Infinity” in the word-salad under “LABELS” in the right-hand column and browse. PayPal is the accepted form of payment. It can accept all of your credit and debit cards. Payment in full will be required before the models are shipped. If payment is not received within 7 days of completion, the models become mine to do with as I see fit, and the Deposit paid is forfeit. Yes, the full retail value of the models to be purchased will be invoiced as a deposit. The remainder of the full $1000 will be invoiced after the models have been finished. Deposits are non-refundable. Do you also paint Warhammer armies?